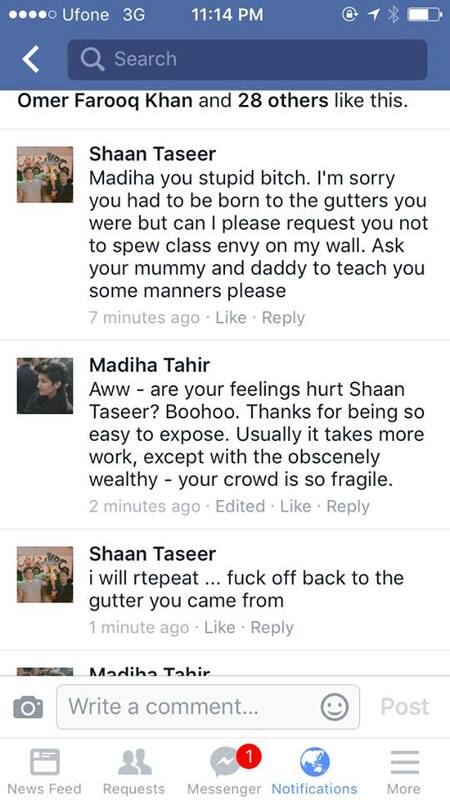 Three days ago, Shaan Taseer, a forty-something scion of one of the wealthiest families in Pakistan trashed a couple of college students half his age, over a school project. The attack was sexist, classist — and public. And, it went downhill from there. 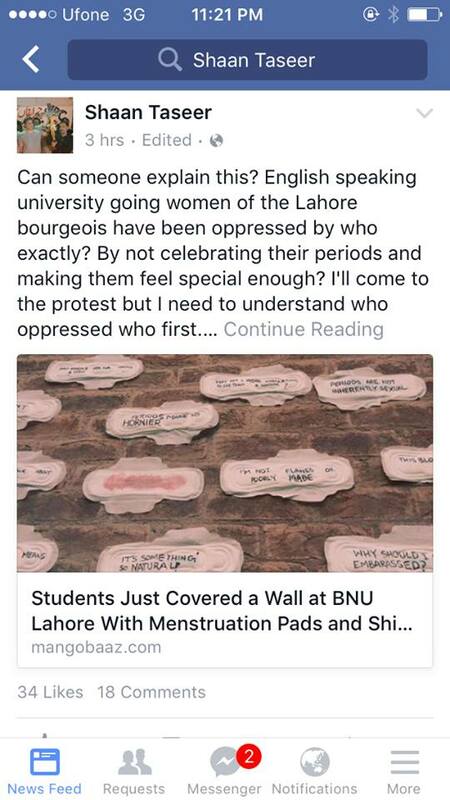 Taseer’s delicate sensibilities were initially offended by the students’ small protest-art installation comprising of 25 sanitary napkins taped to a wall inside their school campus. 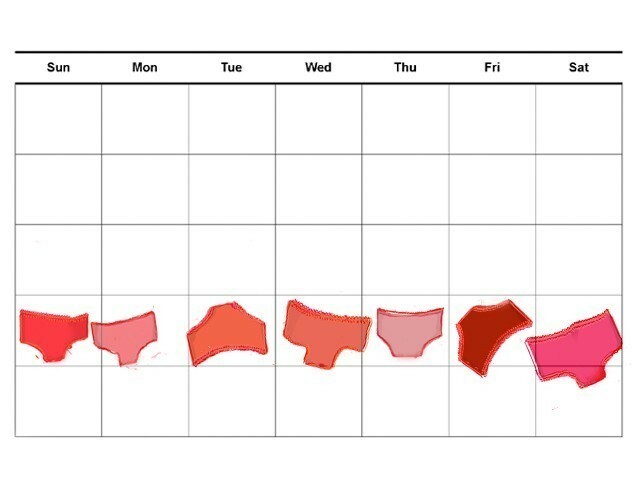 The seven friends, young women and men, hoped to stir a conversation about the body shaming that accompanies the onset of menstruation. Instead, the students, particularly two of the women, were singled out for verbal abuse and harassment. The Urdu daily, Ausaf, published a screed “A Vulgar Education at Beaconhouse” intimating pornographic activities at the school. 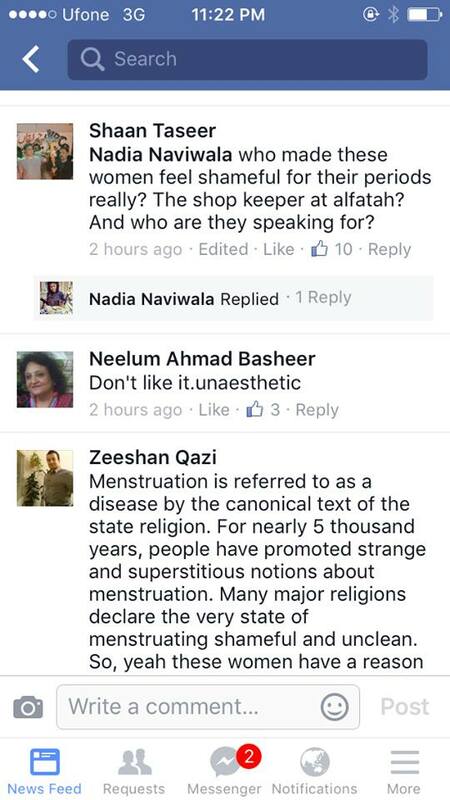 Social media trolls subjected the women to hashtag campaigns “BanPeriods” and “BurnThem” – the women, that is. The comments reached such a fevered pitch that the students temporarily deactivated their social media profiles. 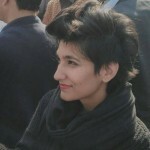 Offline, some demanded to know the identities of the women from other BNU Lahore students. Taseer could not have known any of this, of course, because while he was busy puffing up by punching down, the women had been bullied into silence. While he swaggered and needled and berated them as privileged “bourgeois,” “inbred” women practicing “class apartheid” on an entirely public Facebook post open to any passer-by, the students had quietly refused an offer to write their version for the media. Floating on the triple privileges of social capital, a lifetime of wealthy living, and the sexist entitlements granted to males, Taseer stood large; the targets of his ire meanwhile, were being forced to stand down. 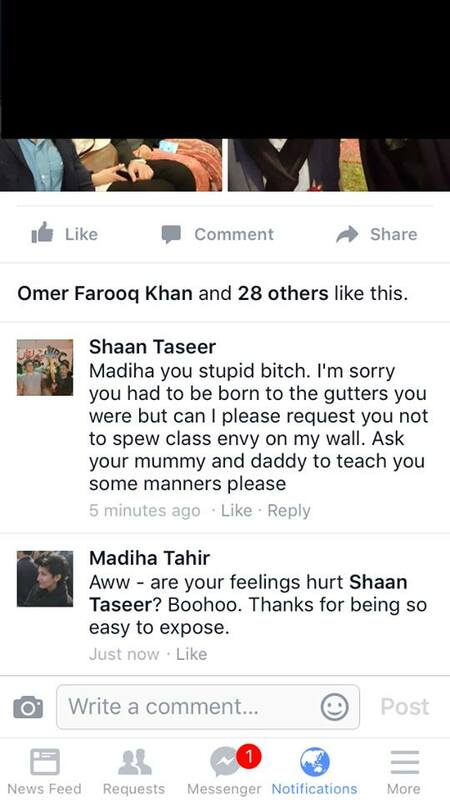 I should say here that Taseer is neither special nor original for his class. 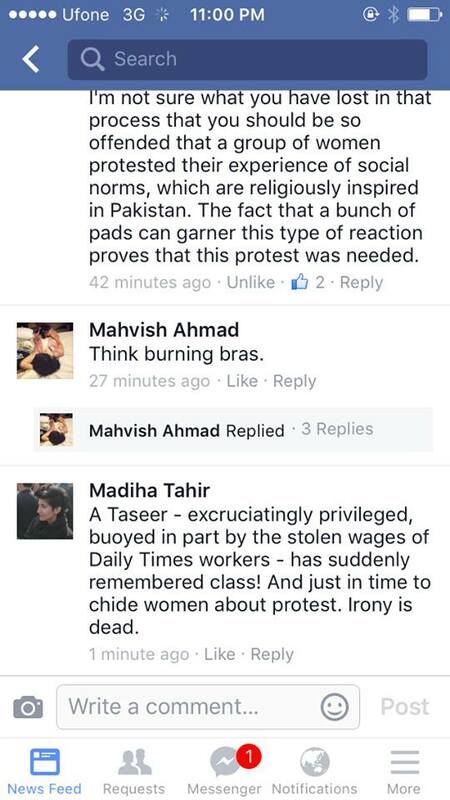 There is a long, ugly tradition of elite men deriding their female counterparts for daring to protest within their own class: among these brocialists, manarchists and brogressives (as one commenter termed Taseer), it is well and good to fight sexism among the working classes, but you’re a privileged, empty-headed know-nothing if you dare raise issues uncomfortable for the male elite. These men exist across the liberal/left spectrum, and they scorn, mock, and belittle women protesting sexism in their own circles. There are, of course, longstanding questions about how to engage cross-class feminist solidarities about which feminists have written thoughtful reflections. But, these tediously predictable accusations allow elite brogressives to obscure their own privilege, and position themselves as arbiters for what counts as sufficiently progressive politics, as if radicalism were some sort of medal these righteous patricians get to bestow upon the rest of us plebes. It is the brogressive version of noblesse oblige. That current and former Times workers have not been paid their wages in full since at least 2009 is a fact widely known. Indeed, just last month, they were tweeting about the issue under the hashtag #DailyTimesPeseDo. Andaleeb Rizvi, who worked as a sub-editor there from 2009-2010, and then again in 2011, says she’s owed Rs200,000. Another former employee is owed over a million rupees. A third, Adnan Ahmed, is also owed nearly Rs200,000 for work there in 2010. In the same year, a fourth former editor I spoke to told me that the situation was so bad that employees took a pay cut to gather money for the family of a deceased employee. That cheque, which was issued from the Times, bounced. These are the circumstances to which I alluded to in my comment. First of all, one is born in a gutter, not to a gutter. I realise that’s a small error, but what amuses me about the super-elite is that often, even with all that bling, they’ve got no grammatical swing. It’s almost as if it’s not their education but their connections that put them in positions of power, at the heads of companies, media houses, and governments. 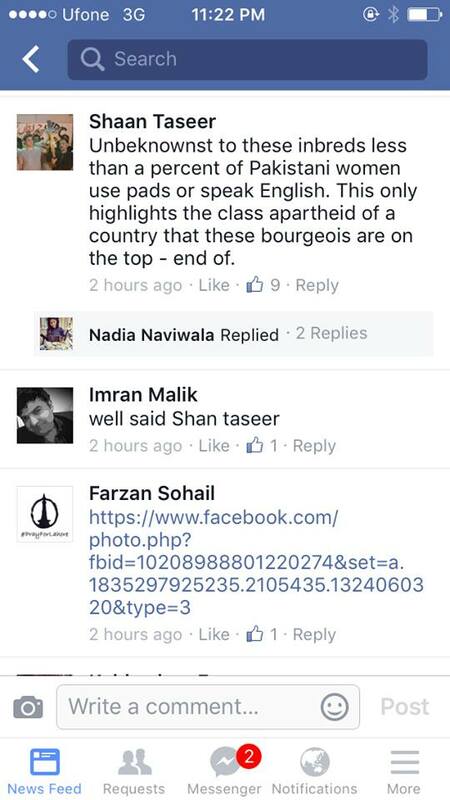 Taseer proceeded for several more postings in this classist vein, calling me, among other things, “lower class,” “filthy,” a “guttersnipe” and a “chimney sweep” – terms that affiliate with Dickensian novels and famously, My Fair Lady, a British tale of class saviour-ship. In it, the upper class Professor Higgins “rescues” a working class woman, Eliza Dolittle teaching her to become a high society lady. This is the world that populates the imagination of our brown sahibs, and the brogressive among them nurse fantasies of saving the ignorant Pakistani hordes from the dark abyss of radicalisation. But, woe, betide the guttersnipe who dares point out their own culpability for the state of affairs. Since his hysterical run on social media, Taseer, his friends, and some of his family have supplied excuses for his behaviour. These range from depression, false allegations that I insulted his family to the bizarre insistence that the admirable courage of their father, Salman Taseer — in standing up for the rights of a poor Christian woman and his subsequent murder by his deranged bodyguard — absolves them of culpability for all things, past or present. The instrumental use of their own father’s death to obfuscate and derail discussions about their business practices and Shaan Taseer’s behaviour is frankly, chilling. The latest explanation to emerge from this camp is to “correct” what they claim is a factual error: It is Shaan Taseer’s half-brother Shehryar Taseer who has responsibility for the Times. In the stories of current and former employees with whom I’ve spoken, Shehryar Taseer pops up frequently, sometimes in a meeting where he is more interested in texting on his phone than resolving their complaints, sometimes telling them the company has no money before hurriedly dashing off. As one former staffer claimed, even when Shehryar Taseer did turn up to meet with his unpaid, broke workers, his bulletproof car was always waiting outside with the engine and air conditioner turned on, ready to leave at a moment’s notice. The immediate responsibility certainly belongs to Shehryar. But, the idea that the only person who derives privilege is the one who directly runs the business, is patently silly. Privilege circulates. This is why restricting the issue to the “technical” fact that Shehryar Taseer is the controlling member of Times is also an ideological stance. It conceals the larger truth that privilege comes in multiple forms: large sums of money, or the ability to access large sums of money if necessary, social capital, access to business contacts and connections — or the casual ability to be a crude, loud-mouthed boor who is so used to people giving him space that he cannot fathom anyone having the temerity to respond. Anecdotal evidence suggests that the Taseers’ other holding, Business Plus, also has issues with non-payment signalling a cross-business issue by the family. “This is their habit,” Rizvi explained to me. And while workers remain unpaid, the siblings are involved in a legal catfight over the massive inheritance built from the sweat and stolen wages of their workers. 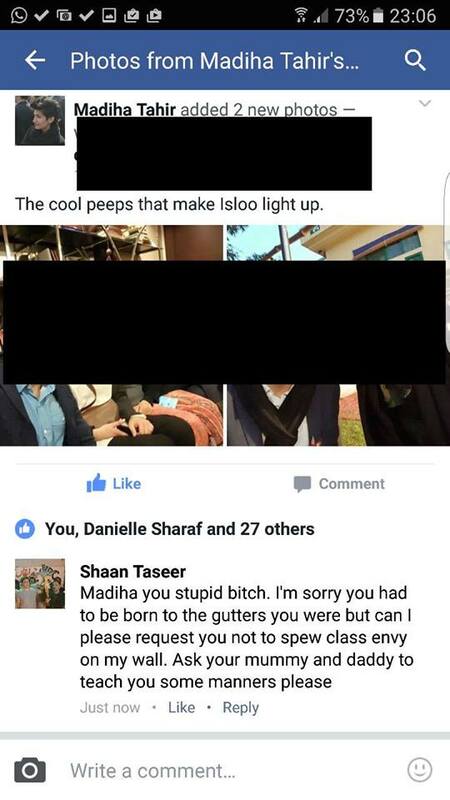 In fact, Sara Taseer, Shaan’s sister publicly posted a day ago about how their inheritance was stolen from them. In a tweet, she provides a link that leads to a Facebook page headlining with images of the Times that discusses the alleged theft. In other words, even if Shaan Taseer doesn’t own a particular holding, he has attempted his hardest to win and profit from that inheritance. It’s just that so far, he’s been unsuccessful. Ultimately, this isn’t about the Taseers. It’s about the intersections of class and feminism that this incident represents. One can find equally rich source material among any of the super-elite. They should know that the chimney sweeps and guttersnipes know about your filth better than you do. Well I am happy at least some newspaper has the guts to post about such topics openly. I have seen one interview of Shaan Taseer on Youtube; An interview he gave to Canada based RawalTV. He “did” come off as a person who is strictly anti-feminist, considering that he originates from Pakistan, where such terms are limited to a small group of a few thousand people. I have noticed in my own dealings with the locals that many of these old-money Pakistanis live in their own little world. Hmm, in one way its OK , because of that rich-kids-of-instagram thing. But, I have yet to see one daddy’s-money guy/girl do something independently great in the field of arts, sciences, or business. In the end, almost all of them become writers of some sort or start painting boats to pass the time. Most “national and international” success stories from the Pakistani side of the spectrum come from middle-class or lower middle-class backgrounds. A classic study into the hatred that a socially upward moving radical feminist of Columbia has for the so-called liberal, privileged elite that is Taseers. 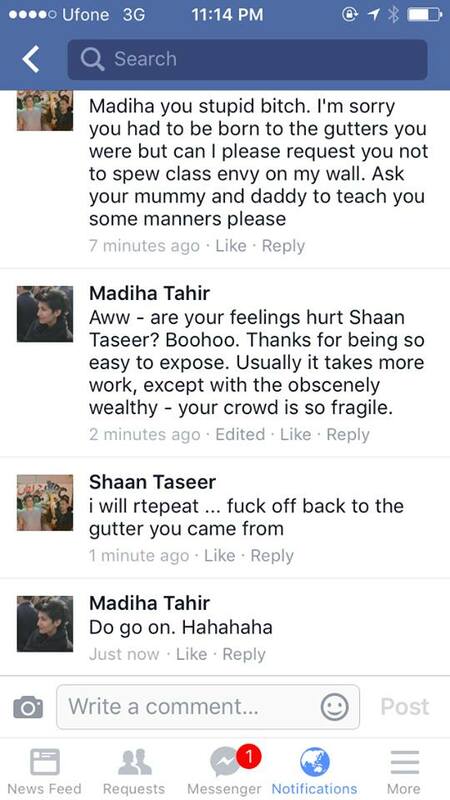 What’s amusing here is Madiha’s claim that Shan Taseer abused that privilege by making fun of the pads protest at BNU, while she conveniently forgets that the feminist issues that she made him a target of, have hardly anything to do with the struggle of working class women in the present day Pakistan. What is exactly your point? You can expose someone by what you did? Really? Jealous that you parents did not leave you a lot of wealth to bask in? 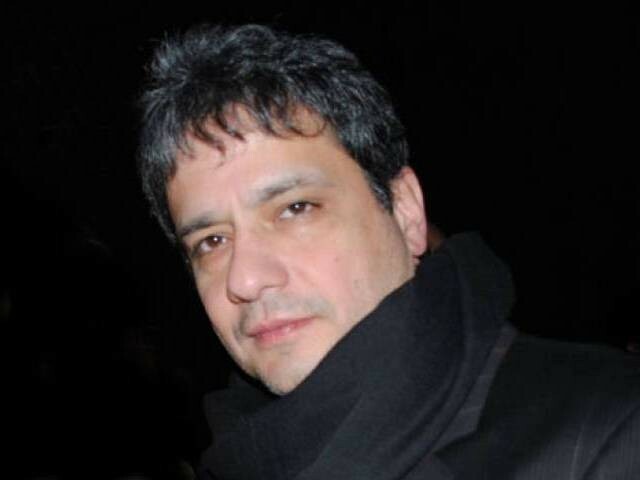 Shaan Taseer might be fighting for Daily Times share, so that he may start paying the staff. What now? You brought the newspaper into a totally irrelevant discussion. He responded aggressively when you blamed his whole family. Even now you are saying that just because he is Shehryar’s brother, he is responsible? Please grow up (and ET please do not delete me). In your tweet about unpaid wages of Daily Times staff, you blamed “Taseers” which means the whole family and Salman Taseer himself. So, yes, you accused late Salman Taseer of a serious crime. If it was not malafide intent, it certainly was lack of knowledge and research. A serious mark on your journalistic capability. Your bickering-laden article reeks of prejudice and larger-than-life ego. Sad to see that ET is now giving space to a weird ‘journalist’. The very heading of this article is demeaning. But it isn’t really about the Daily Times stolen wages; Its because he was rude and it couldn’t just be taken as ‘bakwas’. A huge issue was made out of it. I think most people recognized it as a bad move on his part, but now, with all that has been thrown about, I think the opinion is quite divided. What an infantile response to someone calling you a stupid ***** and guttersnipe. You were offended by his disgusting language? Who cares? Grow up! This wasn’t a class or gender issue by any stretch! Intersectionality? Here? Seriously? You don’t make fb comments into a case study if you’re a serious journalist. disgusting how can such vulgar actions be allowed? used pads over a public wall? gross! what if men started sticking used condoms on public walls? how would make u privileged women feel? not so okay with that one arent u now. NO. Liberalism has NOT being hijacked by the “elite”. Not so. challenged individual. Whose forefathers, were tilling the fields in dhotis. hire out to make ends meet. Nothing wrong with tilling fields. You’re joking, right? This is the problem with pseudo-liberal males. You guys seem to think that because you promote promoteopen when it comes to society, that it suddenly makes you liberal. “Why do women have to make a scene about everything that goes on in their life?” is the type of comment you’d expect from someone who is completely oblivious, if not purposely ignorant, of the issues women have to face every day. To your average male, it seems like a cry for attention from women. But put yourself in these shoes and imagine facing misogyny and sexism on every aspect of your life, including something as basic and biological as your period. The only one joking here is you Mr self proclaimed “pure liberal”. You people think that just because you are high on some agenda so anything contrary to that is absolutely unacceptable. Yes women face problems, but so do men. Even children have a share of their problems. If you are going to act like a looney under the pretext that just because you are a woman than you might wanna save those antics for your fellow femiNazis, because the general population isnt gonna buy those.